The Centrance Hifi-Skyn has finally arrived! Was it worth the wait, Head Pie says yes. What is it? The Centrance Hifi-Skyn is simply a DAC/Amplifier case/skin(Skyn) for your idevice. 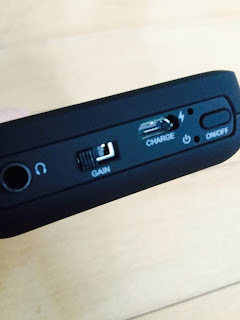 The unit I have is suitable for the ipod touch models 5G and 6G, (it is also compatible with the iphone 5/S although that hasn`t been approved by the Apple labs as of the time of this writing). The iphone 6+ has been approved and Centrance have personally took their iphone 6 and iphone 5 to the labs to bypass any customs difficulties three days ago. `Another reminder that iPhone 5 model will fit iPhone 5S, the iPhone 6 model will fit iPhone 6S, and the iPhone 6+ model will fit iPhone 6S+`. and I was excited to have a chance to listen to the Centrance Hifi-Skyn. The Mini-M8 was designed for IEMs mainly and lacked the power of the mighty Hifi-M8 and I found it a hard item to review. 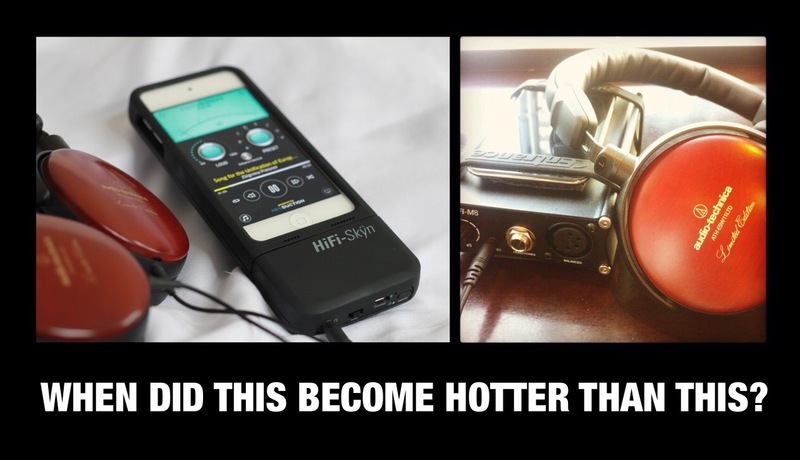 It did what it was designed to do very well, but it simply wasn`t the stunning super charged Hifi-M8 a product that was crowd sourced from head-fi.org members. Travel light and lack a bit of power and detail, or full power, adjustable output impedence and luscious detail. The final choice was a no brainer. I usually took the Hifi-M8. Enter the Dragon, I mean the Hifi-Skyn. What If the power and detail of the Hifi-M8 could be packaged into a small footprint? And thence the Centrance Hifi-Skyn was born. The Centrance Hifi-Skyn is a beautiful piece of engineering and design. We have had in the past the Venturecraft and Vmoda VAMP dac/amp cases for the more clunky iphone 3 and iphone 4/S, as well as the the later Verza model where the phone etc rested on top for a more future proofed design. When I owned my Fostex hp_p1 and A/B`d it against these units the Fostex always won to my ears. I sold my Fostex once I bought the Hifi-M8. The Skyn is well made, solid and my ipod touch models 5G and 6G 128GB fit with no issues, there is a supplied flat mat of rubber supplied to ensure a tight fit, remove it and the case is ready for an iphone 5/S. The buttons are solid. There is an on/off power switch and also three stepped gain switch. Very minimalistic. Also as can be seen in the photo below a 3.5mm headphone out port and also a simple micro usb charging port. The output impedance is set at 1 Ohm, thats `one` Ohm. Good for those sensitive multi driver in ears. To clothe your idevice the process is simple, slide back the forward top part of the Hifi-Skyn, set your idevice back in place, and slide the cover back on. It is a firm locked in fit with no issues of coming apart at all. Fear not! In times past idevice dac/amps only played back at 16/44 or 16/48 depending on whom you talked to. Various members on various forums pointed to hi-res FLAC apps for idevices that promised the earth but couldn`t deliver in reality as everything was down sampled unless it was on the ipad or using a CCK kludge.. I could squeeze it out of my idevice by using the USB B port of the Centrance Hifi-M8 using a CCK but not of course via the USB A port. Many DAC/Amps promised this but the results were the same - down sampling. The Hifi-Skyn plays back your Hi-res tracks via such apps as Flacplayer...natively. A few other recent dac/amps also can do this. One can check using the Flacplayer app. see photos below. *How do I add FLAC? itunes>scroll down to apps>flacplayer>add. But who cares about all that! Move on to the sound I hear you say. We could care less If it had a clunky UI, a terrible build and low battery life as long as it sounded good seems to be the modern mantra for many DAP users these past few years. 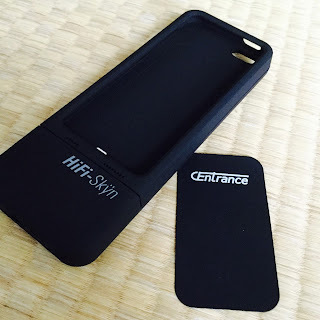 In his review of the Hifi-Skyn for Head Pie DrSheep http://headpie.blogspot.jp/2015/12/centrance-hifi-skyn-review-by-dr-sheep.html writes "The bottom line up front: you will definitely get your money worth with the Skyn. As an owner and regular user of Astell&KernDAPs (AK120 and AK240), the Skyn sounds and performs better than the AK120 (the AK120 only supports DSD64 with PCM conversions), and just as good, if not better, then the AK240 with JH Audio Universal Layla and Toxic Cable Silver Widow 25 8-wired balanced cable." I have been using it as my daily on the go rig, hell I can`t even call it a rig as it is an unobtrusive one piece. Gone are the rubber bands and stacked dangerous looking bits of kit one would think twice about before taking onto an airplane. It is replaced with an elegant one piece solution. But yeah, yeah...we have seen this before Head Pie! Oh sorry, where was I? The sound. The bells, the bells! The sound quality is what sets the Hifi-Skyn apart from its historical competitors, armed with the ever popular AKM4490 DAC and plenty of power the Centrance Hifi-Skyn sounds stunning good. How good? Well my personal test is where I stop listening to the gear and just listen to the music. Simple, yes? I am usually at frist critically listening to the gear to detect any glaring or small faults of the product I am demo`ing at the time. With the Skyn I find that I am turning off that part of brain rather quickly. The Hifi-Skyn in short plays back music as it is recorded, If it is a wonderful recording, that is what you will get, if it is badly mastered or an mp3 you will get a terrible sound obviously. But If you pair it with a mid or preferably high end set of IEMs or headphones the result is fantastic. The instruments sound as they should, bass is nice and sharp - no flabbiness here, sound stage is wide and instrument separation is exquisite. Mids are present and not overly warm, highs are present an extended without any sibilance. The vocals are crisp and creamy when they should be, the vocals and instruments are well balanced, I detest it when the vocals are so far forward I can`t hear the music. On tracks where there is micro details, the Hifi-Skyn picks those up too. Centrance typically goes for a uncolored sound with their releases, which means the user decides whether they want to purchase a reference set of headphones with a more flat response or go for something more colored. In short the Hifi-Skyn is a must for any idevice carrying music lover looking for a simple solution to acquire all the benefits of gorgeous playback on the go. No more stacks, no more downsampling, simple plug and play. Is the Centrance Hifi-Skyn value for money? I would say yes. Comparing the sound to the more `high end` read: pricy daps, the combination of great sound and the ease of Apples UI makes this a no brainer. Also with idevices now having 128GB storage on board one can store quite a huge FLAC or ALAC library for on the go. 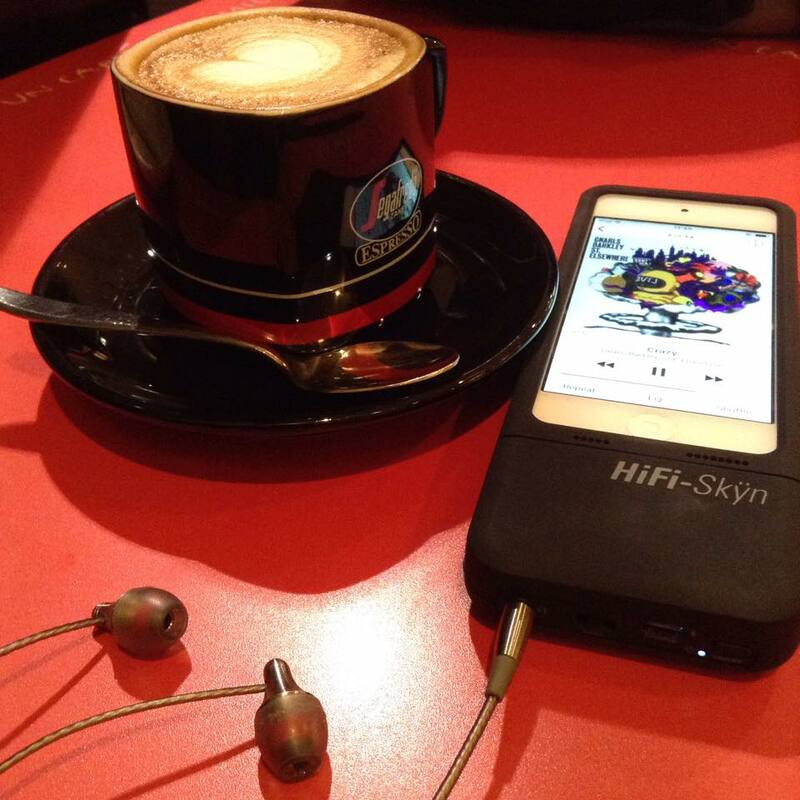 The Centrance Hifi-Skyn is a functional and easy to use device. It`s clean lines and solid build with great design where it counts, with easy access to the various buttons and also to the idevice camera make it a joy to use. It can get slightly warm when in ones pocket, but not overly. It fits well into the users hand, the material it is constructed with is soft, supple yet firm and silky but also has enough friction to maintain a solid grip on the device. The sound quality as mentioned before is wonderful. One gets lost in the music rather than the gear. A big thanks again to Centrance for providing Head Pie with a Hifi-Skyn to demo and review. Can this be used as a usb dac/amp from a pc? FiiO M3 and FiiO EX1 in ears unboxing. CLR-100 - Photo by Najmi.